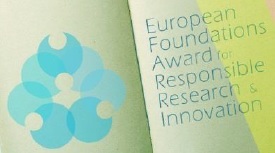 The European Foundations Award for Responsible Research & Innovation has been launched with the aim of celebrating excellent research practices in which the process requirements of RRI have successfully been integrated throughout the research process. There will be three award winners of 20.000€ each. Universities, research centres, individual researchers, research consortia, civil society organizations and any other type of organization involved in a responsible research practice in Europe can apply to the award. The research must be ongoing or has been finalised not earlier than 2013. Your scientific research project or research programme addresses a responsible research practice and is conducted by a university, research centre, industry, civil society organization or other type of organization. Your research coordinator must be located in the European Research Area. Your research must be on-going or have been finalised not earlier than 2013. Your coordinator of the research and his/her team must agree to participate in a case study analysis if shortlisted by the Award Committee. Your research team endorses the European Code of Conduct for Research Integrity. For specific information about the contents of this call contact Sara Heesterbeek by phone + 32 2 549 02 46 or by email heesterbeek.s@kbs-frb.be. And for further general information contact center of the KBF by phone + 32 2 500 45 55 or by email proj@kbs-frb.be. The award is a joint initiative of the King Baudouin Foundation (Belgium), “la Caixa” Foundation (Spain), Fondazione Cariplo (Italy), Lundbeck Foundation (Denmark), the Robert Bosch Stiftung (Germany) and the European Foundation Centre Research Forum.